Hell has frozen over. One of the biggest third-party Xbox One exclusives is making the jump to PS4, and it’s coming as a complete package along with a few extra bonuses. Not content with just bringing the game to PlayStation players and calling it a day, Capcom Vancouver announced Dead Rising 4: Frank’s Big Package. Calling it the “biggest and most awesome collection of video game zombie slaying you could hope for,” Capcom says that Frank’s Big Package will collect all of the post-release DLC, patches, and Super Ultra Dead Rising 4 Mini Golf, along with over a dozen outfits and special attacks from classic Capcom characters. Dead Rising 4: The latest greatest version of the game, including post-launch difficulty settings and upcoming updates. 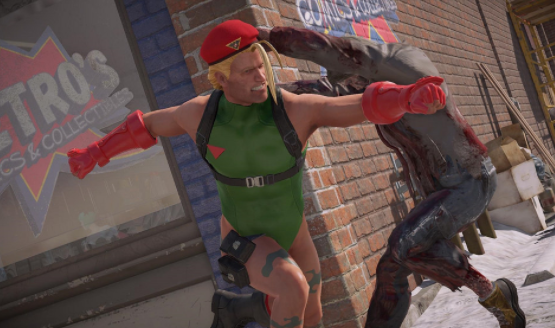 Capcom Heroes: An all-new way to experience the Dead Rising 4 story that lets our hero Frank West wear over a dozen outfits and perform outrageous special attacks inspired by classic Capcom characters. If it’s not exciting enough that the crazy antics of Frank West are heading to the PS4, Capcom Vancouver is really proud of the work they are putting in to allowing Frank to not only cosplay as Capcom heroes, but to adopt some of their powers as well. PlayStation owners won’t need to wait long for Dead Rising 4 PS4. Frank’s Big Package will be releasing on December 5. Which Capcom heroes do you most hope Frank West gets to star as? I’m personally hoping for a Ghosts ‘n Goblins Arthur outfit, complete with armor that degrades until he’s down to his heart patterned boxers.